I decided to get a jump on them, and have already made several. 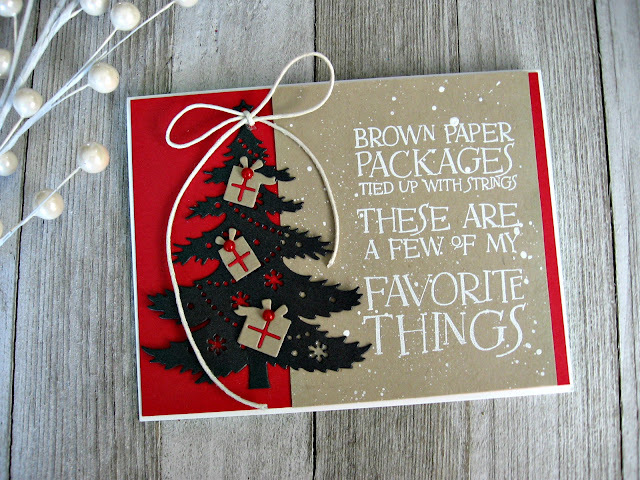 Actually holiday cards are my favorite to make, and Tutti Designs has some awesome Christmas dies. I cut the tree out in black, red and crumb cake. I used the black tree for this card, and added the crumb cake presents. I inlaid the red ribbon on the presents and added some enamel dots. The sentiment is one of my favorites too, and I embossed it in white onto a piece of crumb cake. 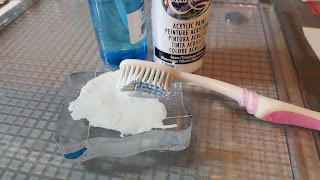 Then I added some white "snow" with a tooth brush and white paint mixed with a spray of water. The last thing I added was a bow...... made of string of course! This is a great Christmas card, Laurie! What a clever idea and fabulous holiday creation Laurie! Thanks for inspiration and a fabulous tip! Well done girl, love it, makes me smile!